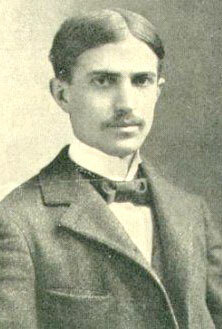 Stephen Crane was born November 1, 1871, in Newark, New Jersey and died June 5, 1900, in Badenweiler, Baden, Germany. Crane was the youngest of fourteen children. His father was a strict Methodist minister, who died in 1880, leaving his devout, strong mother to raise the rest of the family. Crane lasted through preparatory school, but spent less than two years in college, excelling at Syracuse in baseball and partying far more than academics. After leaving school, he went to live in New York, doing freelance writing and working on his first book "Maggie, A Girl of the Streets". His times in New York City were split between his apartment in the Bowery slum in Manhattan and well-off family in the nearby town of Port Jervis. Crane published "Maggie", a study of an innocent slum girl and her downfall in a world of prostitution and abuse, in 1893 at his own expense. It was especially scandalous for the times, and sold few copies. It did attract the attention of other critics and writers, most notably William Dean Howells, who helped Crane receive backing for his next project, "The Red Badge of Courage". Published in 1895, "The Red Badge" was quite different from "Maggie" in style and approach, and brought Crane international fame and quite a bit of money. Rather than plod through moral tropes, the book is subtle and imagistic, while still being firmly entrenched in the realism of the late 1890's in America. Crane's rich portrayal of Henry Fleming's growth through the trials and terrors of a Civil War battle betray the fact that he himself had not yet seen any fighting or battles when he wrote the book. Many veterans of the Civil War (only thirty years had gone by since its end) praised the book for capturing the feelings and pictures of actual combat. Bolstered by the success of "The Red Badge" and his book of poetry "The Black Riders", Crane became subsumed with ideas of war. He was hired to go to Cuba as a journalist to report on the rebellion there against the Spanish. On the way to the island, Crane was in a shipwreck, from which he was originally reported dead. He rowed to shore in a dinghy, along with three other men, having to swim to shore and drop his money in the sea to prevent from drowning. This experience directly led to his most famous short story "The Open Boat" (1897). For various reasons, Crane stopped writing novels during this time and moved primarily to short stories - probably because they could sell in magazines better but also because he was constantly moving. When staying in Jacksonville, Florida, he met the owner of a brothel, Cora Taylor. She accompanied him to Greece as he reported on the Greco-Turkish War for New York newspapers; and stayed with him until the end of his life. At this point, rumors abounded about Crane, few of them good. There was talk of drug addiction, rampant promiscuity, and even Satanism, none of them true. Crane was disgusted with them and eventually relocated to England. After reporting on the Spanish-American War and Theodore Roosevelt's famed Rough Riders, Crane returned home to England. He then drove himself deeply into debt by throwing huge, expensive parties, reportedly at Cora Taylor's insistence. While he could now count Joseph Conrad, H. G. Wells, and other authors in his circle, most people sponged off of Crane and his lavishness. He worked on a novel about the Greek War and continued writing short stories and poetry, at this point to pay off his large debts. The stress of this life, compounded by an almost blatant disregard for his own health, led to his contracting tuberculosis. He died while in Baden, Germany, trying to recover from this illness. He was not yet 29 years old.